Electrostatic dissipative (ESD) workstations ensure a static safe environment by controlling levels of static electricity in the production area. It is vitally important that workers handling ESD sensitive components remain grounded during the assembly process to safeguard against potentially damaging effects of static shocks. 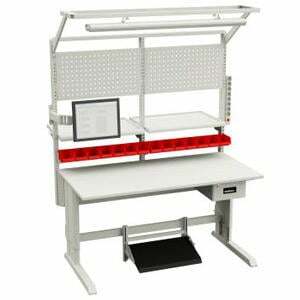 Kaisertech offers a wide range of industrial workstation solutions as stockists of complete workstations, table tops, packing tables, shelving, movable benches, footrests, overhead lighting units and more.